An oldie but goodie with a chocolate twist. 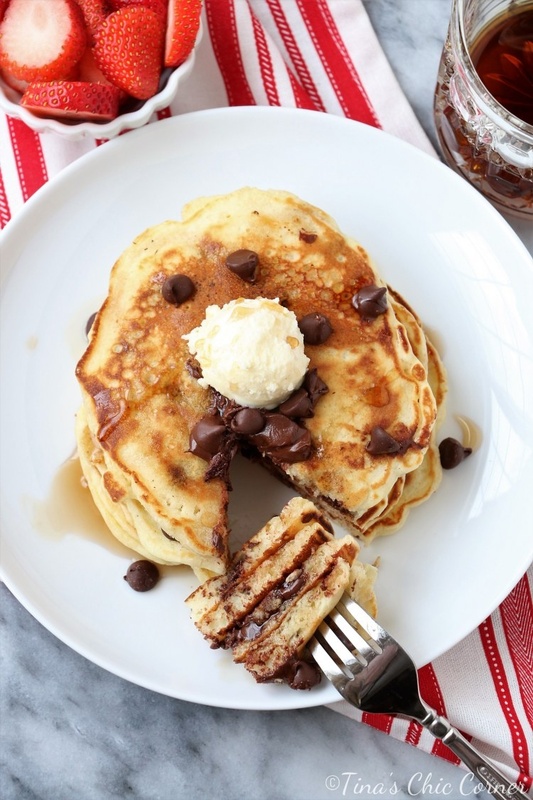 I shared this pancake recipe with you about two years ago (sans chocolate chips). Why am I sharing it again? Because it’s freaking awesome and if you missed it two years ago I wanted to make sure you knew about it. If you saw the original post then you’ll see that I still love this trusty white dish (a really great price from Pier 1). 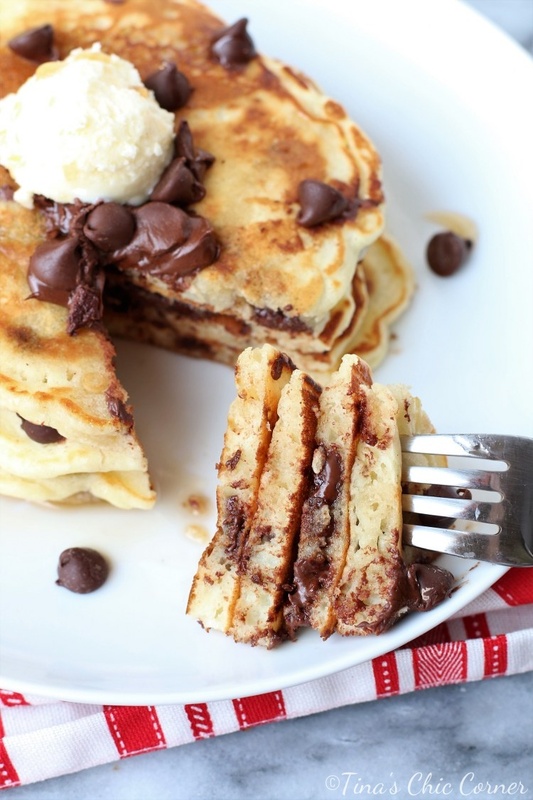 We’ve tried many, many, many kinds of pancake recipes over the years and this one tops them all… by far. We’ve even tried to alter the recipe that I posted two years ago to see if we could make it better and the answer is nope. Oh, and for the record, one of the attempted revisions was born of necessity and failed miserably. Do NOT attempt to make these with almond milk instead of regular cow milk. They just turn out horrible. We figured “milk is milk right?” and they had a completely different (rubbery) texture and even the flavor was weird. Please, please, please make these pancakes for you, your family, your friends, or your loved ones. I don’t usually sell or beg because it’s not my style, but this is one of the most made recipes on my blog and I’m confident on its awesomeness. In a large bowl, add the flour, baking powder, salt and sugar. Whisk to combine. Add the milk, egg, and melted butter. Whisk until smooth. Before each pancake add a small amount of butter to the skillet. Scoop roughly 1/3 cup of batter into a medium skillet over Medium heat. If you are using an electric griddle you should drop the size to 1/4 cup so they fit better. Flip when some of the bubbles that form during cooking stay visible and the edges look a little dry. Cook the other side until lifting the edge reveals a light golden brown color. Brings back memories, Tina. 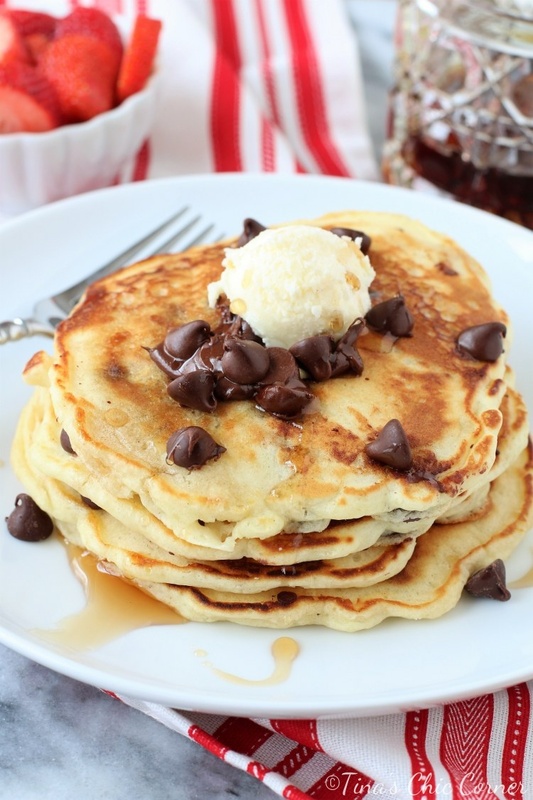 I use to make chocolate chip pancakes for my children when they were small. Only I used a box mix, oh well. I should try this one for the grandchildren now.